BOXERS & SAINTS SHORTLISTED FOR THE NATIONAL BOOK AWARD! 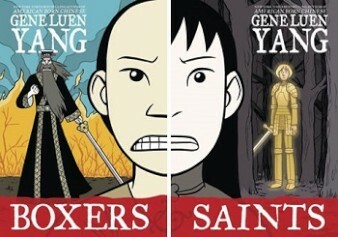 Gene Luen Yang’s Boxers & Saints has been named a finalist for the National Book Award for Young Peoples’ Literature after being named to the long-list a month ago. The winners will be announced on November 20th. Other finalists include Kathi Appelt’s The True Blue Scouts of Sugar Man Swamp, Cynthia Kadohata’s The Thing About Luck, Tom McNeal’s Far Far Away, and Meg Rosoff’s Picture Me Gone. Watch the trailer here: http://www.youtube.com/watch?v=T9JLPevOw68. Next Post RELISH = DELICES in French. YUMMY!